Soil is my new bestie! One thing I like about my bestie is that she is so hardworking. Soil plays many roles in the health and happiness of grape vines and the people who love them (and the people who happy imbibe their wines). Hey Mon! Dirt has more jobs than the Jamaican family from In Living Color. 10. Recycling Plant Foreman: With the help of compost, worms and other mini plant workers, dirt is the world’s first and best recycling plant. The crew of tiny organisms eat waste of all kinds and turn it into humus. My fellow home gardeners will appreciate this! We keep everything – the tops of carrots, radishes, beets and strawberries, banana peels, etc – to feed our lovely worms who in turn feed our lovely plants. That also means less waste goes to landfills. Yay dirt! 9. Head of Pest Control: Some soil helps protect vines from pests. 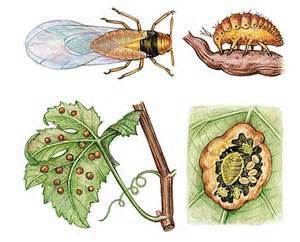 Ever hear the story of the Phylloxera Vastatrix? This tiny little bug (we’ll call him Phyll) is the sworn arch nemesis of our beloved grapevines. In the late 19th century, Phyll and his army laid siege to vineyards all across Europe and almost succeeded in depriving us of the joy of French, Italian, German and Spanish wines. He subsequently reeked havoc in other parts of the word. The recognized hero of this epidemic was (and still is) the rootstock of an American species of grapevines onto which the Vinifera species was grafted. Phyll and them don’t like the taste of American vine wood! But the unsung hero here is soil. We learned that Phyll and fam cannot thrive in sand and schist, so any vines planted in soil that is composed mostly of those types never had to be grafted. And no pesticides necessary! 8. Water Manager: Some soil is prized for drainage – pebbles and gravel, for example. Vine growers like this property because it encourages vines to grow deeper roots. The most obvious benefit here is that the vines will anchor better. But also, when the roots dig deeper, they can tap a treasure trove of minerals and nutrients way down there in the subsoil and even access underground water systems. Also, the vines, which in these types of soil are considered to be under stress, produce less foliage and instead focus all their love on their grapes. The soil in Bordeaux does this job par excellence. In some regions where vines have been growing for decades, the roots are longer than the vines are tall! 7. Tanning Salon Operator: Brightly colored soils, like our beloved Kimmeridgian limestone, reflect sunlight so the lower leaves on the vines also get light from below to photosynthesize and grapes get some assistance ripening. We also find this in the sparkly mixed gravels of the Ribeiro region of Spain. 6. Radiator: In the Châteauneuf-du-Pape AOP in the Southern Rhône, smooth light colored, round pudding stones called Galets that make up the top layer of soil all across the vineyard collect lots of heat from the hot summer sun during the day and they release it at night when the temperature drops so vines don’t get too chilly. Only in the south of France can a plant live such a luxurious life! 5. Storage Unit: The Kimmeridgian soils that are home to the vines of Champagne, the Loire Valley and Burgundy regions have stored marine fossils of shellfish from many ages ago. Vines are happily nourished by a wealth of nutrients from those very fossils. 4. Assistant Vineyard Manager: Soil can help control ripening by managing temperature from below close to where the grape bunches hang. They can also control the amount of acid grapes will have at harvest, which will impact the structure of finished wines. For example high acidity in granite reduces the acidity in the grapes grown in it but also keeps cool and helps grapes still retain some acidity by slowing down ripening. 3. 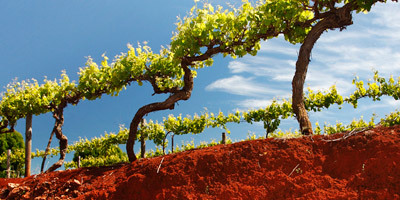 Vineyard Beautification: The soil can be one of the most unique visual features in a vineyard. An example of striking vineyard soil is the viticultural red carpet in Australia called the Terra Rosa, which makes for great for wine country photo ops! 2. Air Conditioning: While some soils are good at retaining and radiating heat onto vines from below, others that are fine, tightly packed and water retentive, like chalk, are good at keeping the vines cool from below. This is how soil can help slow down ripening. 1. Nutrient Marketplace: There’s a lot of nutrition in dirt, remember that the next time you smack your toddler’s hand for putting some of it in her mouth! 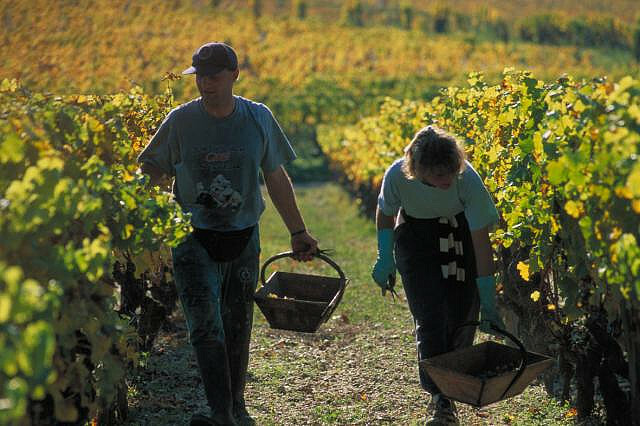 All jokes aside, the soil that vines thrive in, if allowed to do what it does without any “additives”, provides all the minerals and nutrients (including nitrogen) a vine could need to not only sustain life, but to produce great fruit and in turn, as long as the winemaker has skills, great wine. The subsoil is like an organic GNC. Our friend the noble worm is the plant manager. He works hard to make sure that any available detritus is turned into nutrient rich supplements that plants can thrive on. Nutrients also come from decaying fossils, as we saw earlier. See? Dirt doesn’t just lie around, she just makes the job look easy! That’s the mark of a true professional. There is definitely a relationship between the wine you’re drinking and the soil the grapevines grow in. The exact nature of that relationship is, well, kind of complicated. This soil debate is swelling up in the undercurrent of wine academia. In April of last year, the Guild of Sommeliers aired a podcast entitled “The Problem with Minerality: Wine Soil and Geology”. Even as I write this, my super-fancy computer doesn’t recognize this shiny new word: minerality. Nonetheless, it is a commonly used term to define aromas and flavors in wine that we associate with soil in a sense, for where else indeed could these magical minerals come from but the soil wherein the vines reside. In the podcast, the general consensus is that there is no direct relationship between what you taste in the glass and the type of soil the grapes were grown in. In other words, you can’t really taste the dirt in the glass. OK, that’s actually fine! Personally, I’m over this urgent need to make direct perceptible correlations that serve our senses. The Vineyard Soil Expedition will not attempt this, just to be clear. While we will do a bit of work drawing correlations between soil and wine quality, this will involve much more than just the dirt itself and the wine itself. In actuality, in the soil – wine discussion, we have to talk a lot about that little hyphen between them. What is it that connects these, the origin and the end? The most important connector, given the fact that there are other variables (weather conditions, for example) that can be navigated as need be to coerce a specific outcome, is the people. We can look at the list of over 40 different vineyard soil types listed on Wikipedia, which grape varieties have made their happy homes in what soils, etc. But at the core, the connecting element, the deciding variable is the human variable. For example, in the wine community, we have come into agreement that Chardonnay grape vines thrive well in limestone-based soil, as evidenced by the prominent vineyards on the Kimmerigian plate that stretches from the white cliffs of Dover in southern England through the Champagne and Chablis regions of northern France. In Champagne, Chardonnay is the reigning white variety, while in Chablis, she is the sole sovereign. So based on this, based on the centuries of success that wine producers have had with this variety on this soil, it stands to reason that limestone is Chardonnay’s preference… right? Of course, the answer is that it is not that simple. Remember our little hyphen? We need to discuss that. We need to discuss what kind of a relationship each vineyard holder has with the portion of that soil he has been blessed to steward. What is the overall farming philosophy? Is the land cultivated in monoculture (only one crop all the time) or polyculture (two or more different crops on the same beds, rotated periodically)? What inputs are used – manufactured products to control pests and promote growth? Herbal teas and other biodynamic treatments made onsite? Irrigation? Is vegetation allowed or prohibited at the vines’ feet and between the rows? What wildlife coexists in the region and are they welcomed, discouraged, inhibited, besieged? There’s a lot to consider. The first indicator of wine quality at the end of the day is how the people who grow the grapes manage the soil-wine relationship. I recently tasted some of the Rieslings from the esteemed Weingutt Dönnhoff, which is in Nahe, Germany. The distributor, Michael Skurnik Wines, gives some background about this the Dönnhoff family on their site. 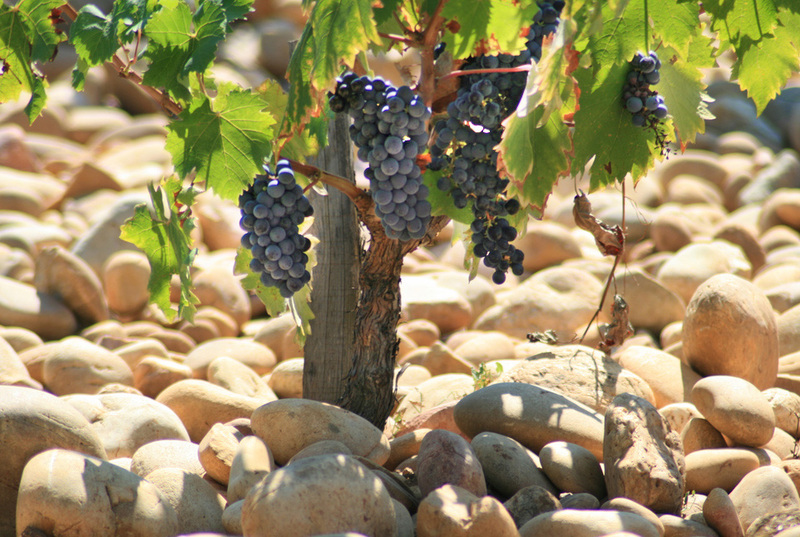 After a brief introduction to the family, the rest of a long paragraph details the soil type in each of their vineyards – volcanic rocks with fancy names like porphyry and melaphyr, slate in some, a layer of pebbles over loam subsoil (loam is the brown stuff we know as regular ol’ dirt) in others. Of one, the author writes “Due to the water table that flows beneath the vineyard’s soil the Krötenpfhul (vineyard) has always been farmed organically, even before it was held by Dönnhoff.” At the tasting, they had photos on the table, one just of a patch of soil. Evidently these are wine people who understand the importance of dirt. 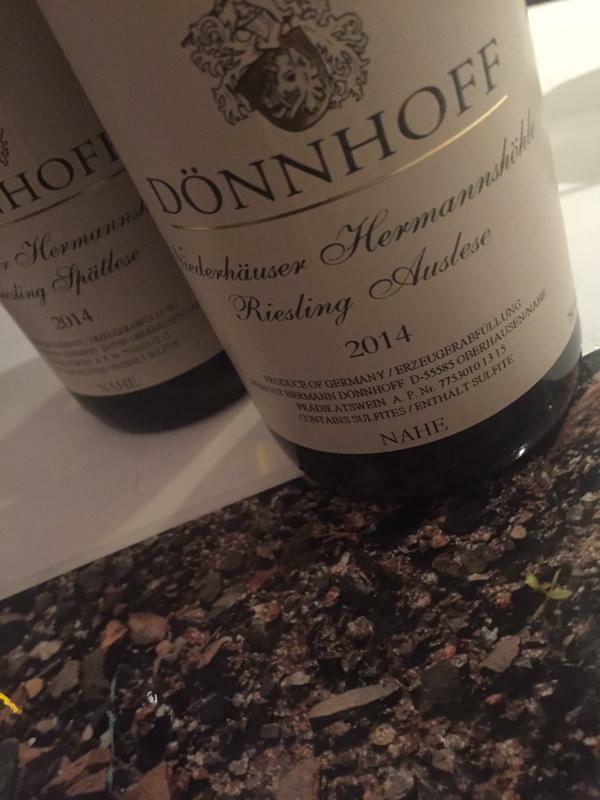 Dönnhoff Riesling Trocken Roxheimer Hollenphad 2014 – This has some energy on a long palate as well, with very little fruit but a hint of lemon, and wet stone. The energy is intense! Dönnhoff Riesling Kabinett Oberhauser Liestenberg 2014 – Here is a bit of sweetness that (subsides) on the back palate and leaves you with lovely mango, guava, papaya fruit. This is classic Riesling! Needless to say my mouth was rather happy overall. What was fascinating was that the wines had an energy that was hard to explain. Although I am newly reluctant to look for direct connections between soil types and wine characteristics, I couldn’t help but wonder what role the soil played. But again, the question is not just what role it played, but how the Dönnhoff vineyard managers and winemakers leveraged it. I called my company wineLIFE partly because of my belief that wine is alive. 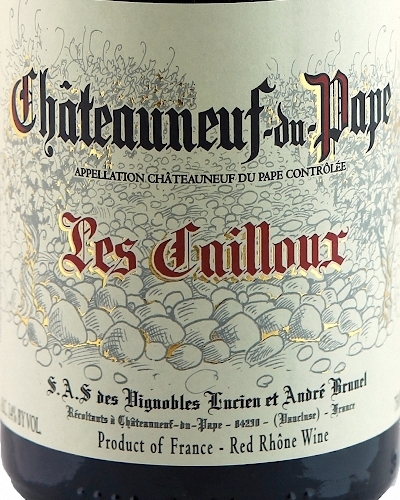 It continues to age after bottling, evolving and maturing until at some point, it actually dies. No other beverage behaves that way. If it’s true that wine is a living thing, then we have to also believe that soil is alive, because life has to come from life. So perhaps this Vineyard Soil Expedition becomes a biography of sorts. The Biography of Soil. The untold story of a life-sustaining being. During World War I, the Italian Front saw a series of battles between Italy and Austria-Hungary. There was a series of battles fought along the Isonzo River between 1915 and the end of the war in 1918. The two images featured in this post were taken along this front in what is now Slovenia. The first image shows a wine magazine in Britof in what appears to be a rugged location. 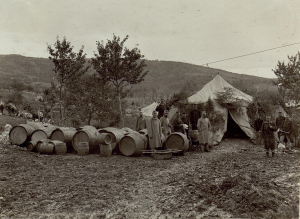 There is a central large tent flanked by 13 men and a large cache of wine in barrels. The wine is stored in both large casks and smaller barrels. Amongst the casks are what appears to be a box with two poles used to carry the smaller barrels. There is also a small barrel on a dolly or cart. In the back left are donkies or mules that might have carried the smaller barrels of wine. Been thinking a lot about dirt lately. Recently married a farmer in Trinidad. Started a garden on the terrace of my New York City apartment. Thank goodness my dad is here, because I’ve never had much of a green thumb. He’s showing me now how to really get the tomatoes, green peppers and herbs to flourish. My terrace garden last year paled in comparison. Having said that, last year, we had something that this year we have yet to establish: worms. 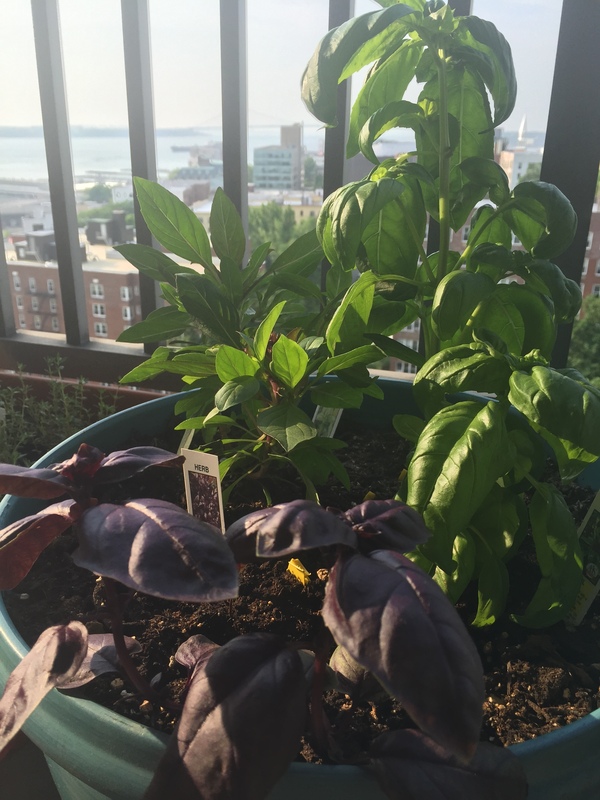 Classic Siam Basil, pointy leaf Sweet Basil and the pretty purple Osmin Basil. Last year, I helped my daughter (then 5 years old) do a science project about worms. At our local farmer’s market, we talked to a woman who spent her time there educating shoppers about how worms make humus from food scraps. She was even collecting compost for use in NYC Parks. I had always known that food scraps were worth more than we thought! My rationale was that I paid by weight for the food, and yet had to peel and cut away inedible pieces that I had paid for to discard. So I started collecting food scraps many years earlier, using onion and garlic skins, carrot ends, and other bits that we wouldn’t eat but were clean enough for us to boil at some point to make stock along with the carcasses of whole chickens and fish heads and spines I had butchered in previous weeks. This kind of food currency is safeguarded in my freezer for use. Other scraps, like egg shells, banana and citrus peels and the like, went into a pot on my terrace for compost. Then when we decided on the princess’ science project, we dug up worms in a nearby park and brought them home to feast on what we had collected. I recently watched a documentary about dirt and now I have a bunch of questions. In the documentary, Gary Vaynerchuck (of Wine Library TV fame) mused about vineyard soil standing next to a vine with a glass in one hand and dirt in the palm of the other. He licked the dirt! It was pretty awesome! At the beginning of the documentary, the narrator quipped that children don’t go outside to play in the “soil”, they go play in the “dirt”. I remember playing in the dirt. I loved the dirt! Then, later on in the film, an inmate at Riker’s Island who was participating in a program planting gardens said a phrase that conjured up so many memories from my Brooklyn childhood: GOD MADE DIRT AND DIRT DON’T HURT! We kids would say that phrase if a piece of candy fell on the ground. We would pick it up and say that and then we would eat it anyway. And you know what? The dirt didn’t hurt!!! In my journey deep into wine academia, we were always taught that Vitis Vinifera (the wine grape species) vines flourish in poor soils. In contrast, learning about organic and biodynamic farming has taught me that soil must be rich to sustain life. Dirt is alive. Dirt is life! I need answers! Driving to work one morning on the M6, then WSET Advanced Certificate student Rashida Veronique Serrant turned a corner - literally and figuratively! As she rounded a bend in the roadway on the South Island of New Zealand to enter Gibbston Valley and laid eyes on the sun-drenched vineyards of Chard Farm Winery on the other side of the Kawarau River gorge, Rashida knew what kind of life she wanted. Here are some more highlights from my not-so-ordinary life: •	Studied abroad in Birmingham, UK at the /Birmingham College of Food. •	Returned to Birmingham post-graduation for another year of study, including Wine and Spirit Education Trust Certificate. Also earned basic PADI SCUBA diver certification. •	Travelled by trains and taxis around the Thai-Malay peninsula. Earned basic PADI SCUBA diver advanced certification. •	Lived in New Zealand for 1 ½ years – bungy jumped and SCUBA dived the Great Barrier Reef on a visit to North Queensland, Australia. •	Lived in Honolulu, HI. •	General Manager of 2 New York City wine shops, worked as a buyer in one of the city’s oldest wine and liquor stores. •	Earned Diploma of Wine and Spirit from the Wine and Spirit Education Trust. •	Served as President of Women for WineSense NYC Chapter. 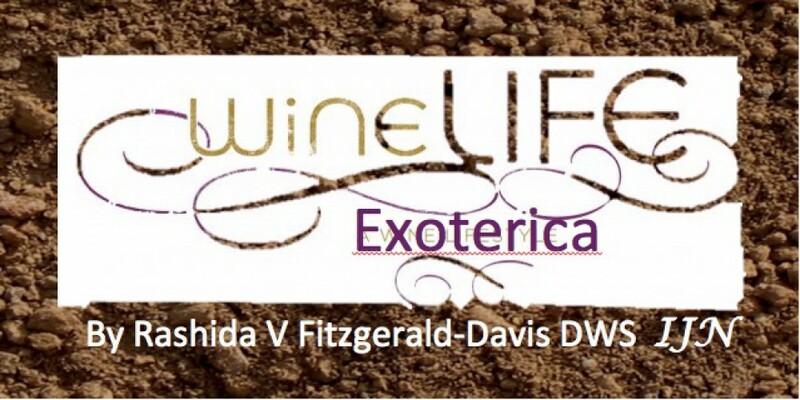 •	Taught seminars on organic and biodynamic wines in New York. •	Served on the Board of Directors of Council for the Arts and Humanities of Staten Island. •	Worked on 4 restaurant launch teams in two countries. •	Owned and operated a wine shop in New York. •	Taught Wine and Spirit Education Trust Foundation Certificate course. •	Founded The Really Nourish Movement. God has blessed me with an amazing life, and He is positioning me for even greater pursuits that will allow me to help many people. Thanks for taking an interest in me! I look forward to serving you in some way!